The farm is a finishing swine operation that houses approximately 9,000 pigs near Yadkinville, NC. The concept for this approach was conceived by the team in 2006, followed by economic and performance modeling, permitting, and construction of the commercial-scale system. The project was commissioned on May 27, 2011. Funding for construction was provided by Duke Energy and Duke University, with support from USDA-NRCS and the NC Division of Soil and Water Conservation. Google provides operational funding support in exchange for a portion of the carbon offsets created. Loyd Ray Farms is the only innovative Swine waste system in North Carolina that generates Renewable Energy Credits for an electric utility, which generates enough power for the treatment system and has enough surplus electricity to power about half of the farm. Cavanaugh collaborated in this study with Duke University, Duke Energy, and Google with funding from NC Soil & Water Conservation and USDA/Natural Resources Conservation Service. The project began as a conversation about greenhouse gas emissions, sources for renewable energy, and sustaining the state’s swine industry among Duke Energy, Duke University, Google, and Cavanaugh. That conversation led to a project that is getting attention around the world, for its successes in combining strategies to address the concerns for generating renewable energy from agricultural sources, sustaining agriculture, and addressing farming’s relationship to climate change. Is Manure to Energy Important? We will discuss the successes and challenges in partnered efforts by farmers, electric utilities, and other stakeholders in the marrying of renewable energy generation with enhanced environmental treatment and green house gas emissions reduction, including the economics of such effort. Waste generated by the animals is flushed into an anaerobic digester where bacteria consume the waste and respire energy-rich biogas. 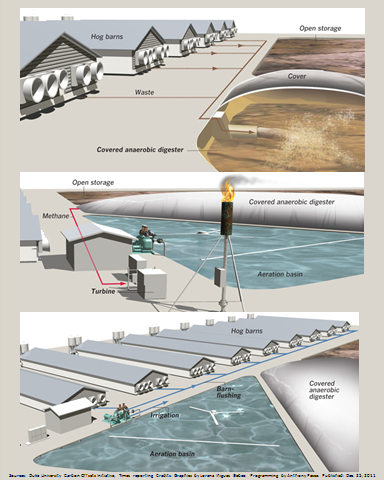 The biogas fuels a microturbine that generates electricity, and excess gas is flared. After digestion, the liquid waste is further treated to achieve the Environmental performance Standards set forth by North Carolina for Innovative Swine Waste Treatment Systems. The process by which the stakeholders came together in a partnership, the technologies and approaches selected, and the successes/challenges that can be gleaned for advancing future projects. The Loyd Ray Farms project is the first Swine Waste-to-Energy project in the State of North Carolina to place RECs on the North Carolina Utilities Commission REC Tracking System, and is the first swine farm in North Carolina to transfer RECs to Duke Energy. Coupling techniques to improve the environmental treatment system employed at the farm, the Loyd Ray Farm project is also the first ‘Innovative Swine Waste Treatment System’ permitted that utilizes an anaerobic digester as a primary form of waste treatment. 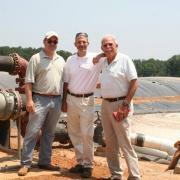 Gus Simmons, lead designer, M. Steve Cavanaugh, Jr., and Marvin Cavanaugh, Sr. during the commissioning of the system. 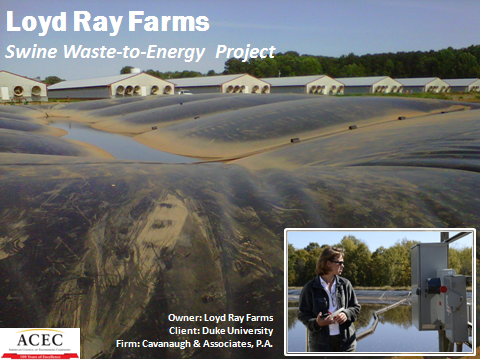 Cavanaugh developed the concept for Duke University in an effort to create a cost-effective solution that converts swine waste into renewable energy while achieveing a superior level of waste treatment and a reduction in the carbon footprint created by the conventional waste management system. Gus Simmons, P.E., is the Director of Engineering at Cavanaugh & Associates, a consulting firm specializing in stewardship through innovation. An NC State University graduate with a BS in Biological & Agricultural Engineering, Gus has worked for a major agricultural producer where he was Director of Environmental Affairs and Engineering Services, managing engineering and construction for facilities in the US and Europe. Gus has designed, permitted, and managed over 5,000 acres of wastewater irrigation in NC, and thousand of acres of wastewater irrigation in the Western US. He has assisted many municipalities and private entitites with the development and implementation of reclaimed water systems and reuse irrigation systems, and has actively participated in alternative wastewater management strategies for the NC Pork Industry. His recent sucessess include the engineering design of an anaerobic digester for animal waste to energy project in Yadkinville, NC which has gained world-wide recognition for its successes in generating RECs and greenhouse gas credits.